The Festival makes it Piedmont Piano Company debut with Paul Sanchez as composer and pianist, whose works were well received at last year's inaugural festival. 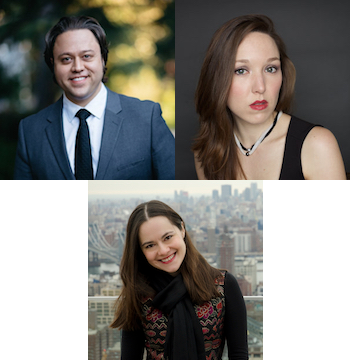 Joined by the soprano Kayleen Sanchez, he will present his setting of six poems by Sappho, paired with Graham Lynch's setting of Sappho, followed by a world premiere of a work by David Gordon for one pianist playing a concert grand and upright in special tuning. Daria Rabotkina then performs works by Schubert and Rachmaninoff in anticipation of her solo recital the following evening in SF. Don't miss the only chance to hear Daria in the East Bay this season! Dr. Sánchez currently serves as Director of Piano Studies and Director of the International Piano Series at the College of Charleston in South Carolina. He has also taught at the Baylor University School of Music and at the Wheaton College Conservatory of Music. He is a frequent adjudicator in piano competitions throughout the United States, and is the co-founder of the Dakota Sky Academy. Sánchez studied with Tamás Ungár at Texas Christian University, and with Douglas Humpherys at the Eastman School of Music, where he completed his Master of Music and Doctor of Musical Arts degrees. Sánchez is a New Piano Collective artist. Praised for her “keen technical virtuosity… her voice [that] thrills along the spine” (Sherod Santos, 2016), soprano Kayleen Sánchez is an active performed, pedagogue, and recording artist with particular passion for early and new music. She is a founding member of the lute song duo BEDLAM. Recent BEDLAM engagements include the Phoenix Early Music Society, Pegasus Early Music, and the Rochester Early Music Festival. BEDLAM has been broadcast on Rochester’s WXXI, WWFM’s “Well-Tempered Baroque”, South Dakota Public Broadcasting, and Arizona PBS. BEDLAM released its debut album, BEDLAM (Athyr Records) in 2015, and their next album, Died for Love (Soundset Recordings) will be released in 2017. BEDLAM’s active touring schedule can found on their website at bedlamearlymusic.com. American composer David M. Gordon praised her performance of his music as “deeply moving and extraordinarily precise,” and dedicated a large-scale song cycle, “Mysteria Incarnationis,” to Sánchez and her husband, pianist Paul Sánchez. Kayleen is also featured on the CD Magus Insipiens (Soundset Recordings, 2016), performing song cycles composed by Paul Sánchez. She will be featured on the upcoming CDs West Meets East (Albany Records) and Music of George Morey (label TBA). She recently recorded Schubert’s Schwanengesang with pianist Johnandrew Slominski on a Viennese-style fortepiano. Their recording will be released on the Soundset label, and features ornamentation and other historically-informed performance practices. Sánchez received her Bachelor of Music and Master of Music degrees in Vocal Performance and Literature from the Eastman School of Music. She is on voice faculty at the College of Charleston in Charleston, SC. Whether in front of an orchestra, in the recital hall or in a chamber music setting, Daria Rabotkina impresses audiences and critics alike with her “clearly prodigious musical gifts” (The Washington Post). Audiences find her to be “the real thing” and “spellbinding in everything she played.” (The Boston Musical Intelligencer). Concerto highlights include San Francisco and New World Symphonies, Kirov (Mariinsky) Orchestra, Moscow State Symphony, collaborating with conductors Michael Tilson Thomas, Valery Gergiev, Vladimir Feltsman, Julian Kuerti, JoAnn Falletta, Benjamin Shwartz, and Giancarlo Guerrero. Dr. Rabotkina has given recitals at the Kennedy Center, Weill Recital Hall at Carnegie Hall and Merkin Concert Hall, Ravinia’s Rising Stars and Dame Myra Hess Series in Chicago, the Moscow Tchaikovsky Conservatory and in Denmark, Switzerland and Japan. Winner of the 2007 Concert Artists Guild International Competition, Dr. Rabotkina has received top prizes at many international competitions and participated in Russia’s White Nights Festival, Finland’s Kuhmo Festival, Copenhagen’s Summer Festival and Germany’s MusikFest in Kreuth. In the United States, Dr. Rabotkina has appeared at the Rockport Chamber Music Festival, International Keyboard Institute and Festival, and Music Academy of the West. Dr. Rabotkina was born in Kazan, Russia, in to a family of musicians and gave her first solo recital at the age of ten. Her earliest musical steps were guided by her parents, Guzel Abdoullina and Sergei Rabotkin, both outstanding pianists, and Nora Kazachkova at the Special Music School in Kazan. She received her education at the Kazan State Conservatory and Mannes College of Music in New York City under the tutelage of Vladimir Feltsman. Dr. Rabotkina also holds a Doctorate degree and the Artist Certificate from the Eastman School of Music where she studied with Natalya Antonova. Daria Rabotkina is currently serving as an Assistant Professor of Piano at Texas State University in San Marcos.